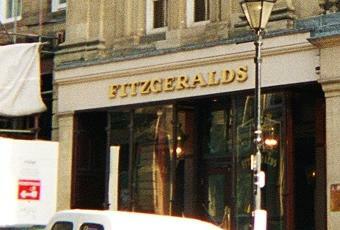 General information: In terms of pub locations, Fitzy’s in Newcastle is hard to beat. It’s situated on the elegant Grey Street, which is by far the city’s most stunning street in terms of striking architecture. It’s also within walking distance of the prestigious Theatre Royal, it’s close to the Quayside, and it’s in the perfect spot for anyone wanting a smart venue for a business lunch, or a chance to wind down after leaving the office on a Friday afternoon. The pub itself continues to grow in popularity, and buzzes with activity all day, every day. Why? Because it’s recently been mentioned in the Real Ale Guide, it offers an ever-changing list of guest beers handpicked by its customers, and it boasts a wide selection of good food. So not only is it a place where people love to be seen during the day – it’s most definitely a great night out, too. Completely refurbished a while back. Has six ales on from local, regional and national breweries. Much improved. Not a bad little pub on one of Newcastle's main streets. The interior is quite ornate, but also a little worn in places especially the carpet. 4 ales were on - Fyne Avalanche, Black Sheep Best Bitter, Mordue IPA & Jarrow Rivet Catcher. Westons Country Perry was also available. The pub was strangely quiet, given it was a Newcastle match day. Bacchus is just around the corner and was far busier. It's easy to walk past this place and not notice it. For those who spot it and venture in then you're in for a treat. Wonderful old-style decor leading all the way to the back where the bar is situated. Dotted around are wonderful seating booths which protect you from the hussle and bustle of the bar area. The front the pub is quieter and seating is easier to come by. Staff are quick and the pints are fine. If it's 5pm on a Friday and you're on Grey Street and fancy a wee tipple, it's the best by far. Managed to miss this place for a few months due to its narrowish entrance. Well pleased when I did discover it though. Real ales, good atmosphere, no screeching and nicely laid out. Friendly staff too - well worth a visit! Very nice interior, a rarity with new bars but the Fitzgeralds chain usually know what they're doing. Decent selection of local and national ales, usually 3 0r 4 to choose from, and the location on impressive Grey Street is hard to beat. One of the better city centre boozers.